The old city of Acre (Akko) is a large walled city on the shores of the bay of Haifa. As the largest natural port in the Galilee and Israel, it has a long history of conquests and ruling empires. It was one of the main Crusaders' fortifications and ports. 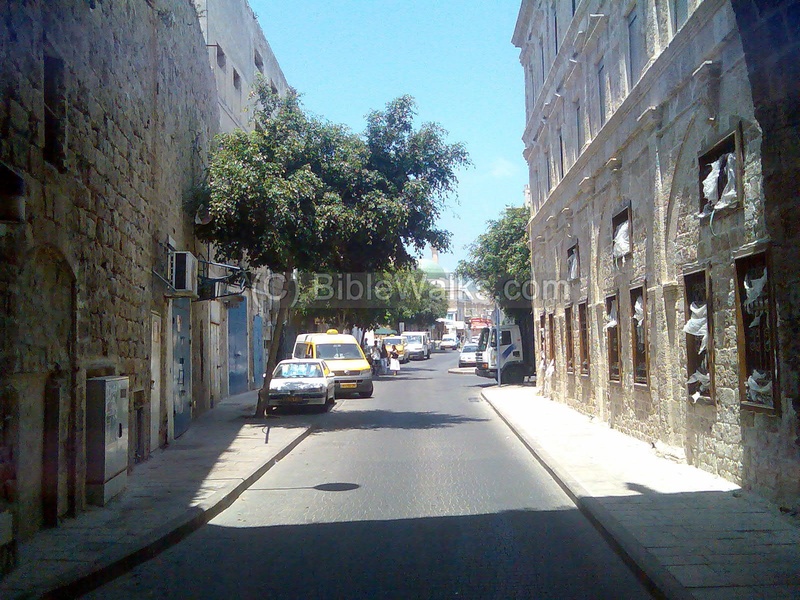 The Old city of Acre is one of the fascinating old cities in Israel. It is a UNESCO World Heritage Site. Rich in history, spanning from the Greek periods, this ancient city has fascinating points of interest as well as a charming location along the Sea. 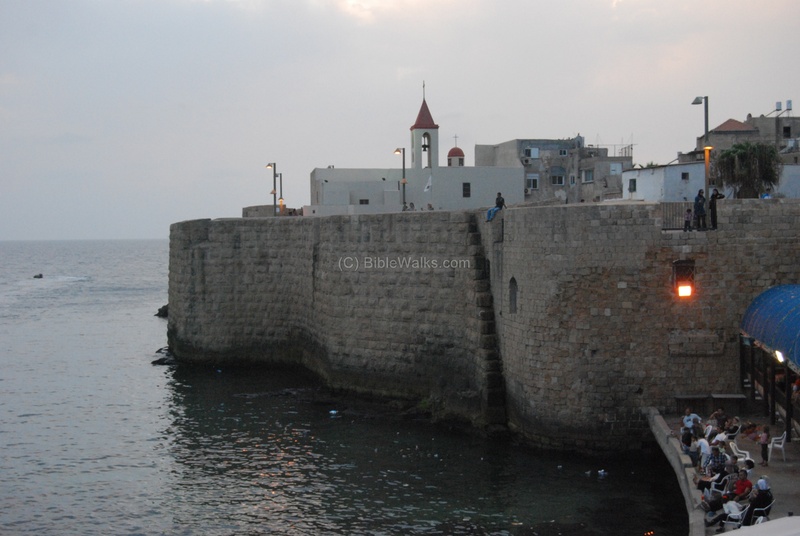 Acre is well known as one of the main Crusaders cities. Acre is located at the North of Israel, on the shores of the bay of Haifa. The Old City is located on the south eastern side of the city, and is surrounded entirely by a wall. 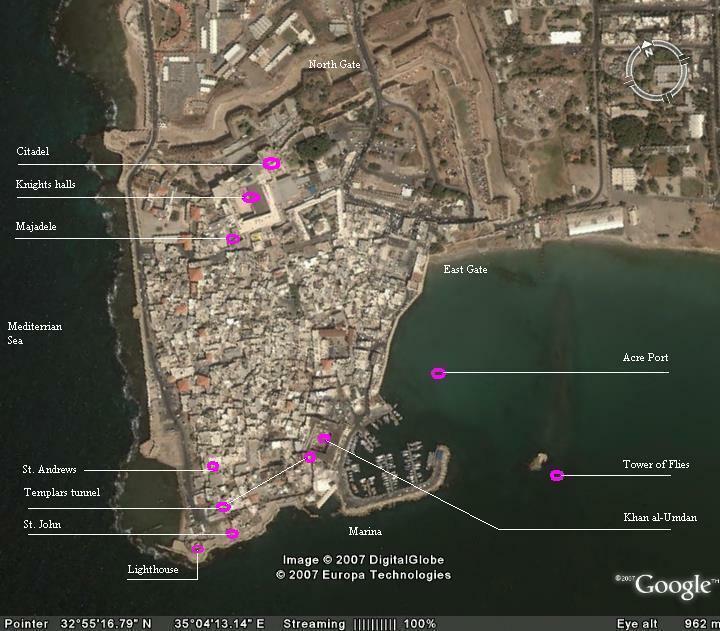 An aerial map of the old city of Acre is shown below, indicating the major points of interest. Pointing on selected purple points will automatically scroll to the relevant web page. Acre/Akko was inhabited from the Bronze age to the Roman period in a tell (mound) east of the old city, on the north bank of the Na'aman river. It was abandoned at the Hellenistic/Roman period. (See a detailed review of Tell Akko - the biblical site of Akko). The Romans built a breakwater and expanded the harbor at the present location of the harbor. At the Arab period the old city was built at the present location, later fortified by the Crusaders. The following list shows a long chain of conquests and ruling empires over thousands of years. 8-6TH C BC Major port for the Phoenicians (from Sidon); city named "Ace"
An aerial view, captured by a drone 100m above the north east corner of the old city, is seen in the picture. 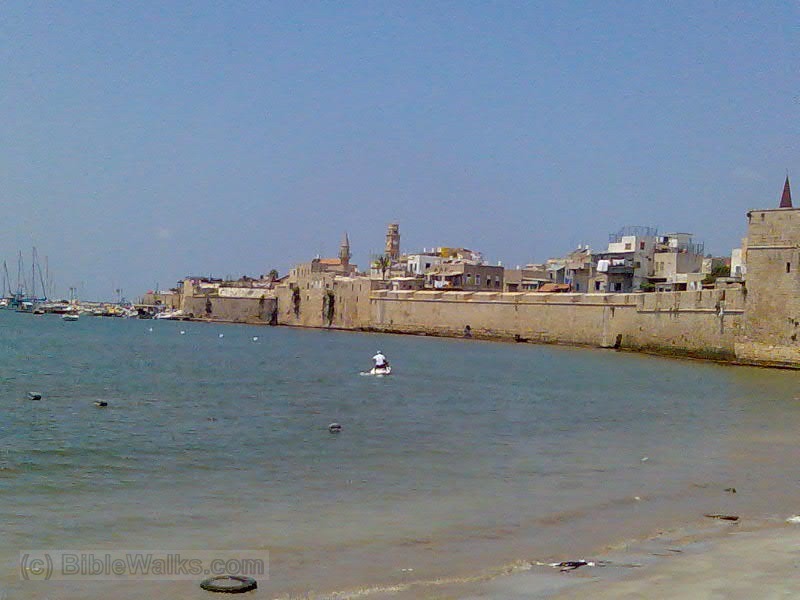 The old port of Acre is on the far left side. Behind, in the background, is the bay of Haifa and Mount Carmel. In the center of the view if the new Acre hostel. On both left and right margins are the city walls and moat, with the entrance bridge located above the moat on the right side. A view of the old city from the eastern gate side is shown in the following photo. The ancient harbor, still in use today, is seen on the left side. The western side of the old city stretches along the shore, as can be seen in the following photo. The wall can be seen, with a tower at the far end. You can walk along the wall around the whole city. In the background - Mount Carmel and the port city of Haifa. A closer look on the western side: the lighthouse at the edge of the city. In the background - Mount Carmel and the bay of Haifa. On the left side - the houses of the Arabs that live in the old city. It is also the western side of the Templars tunnel. 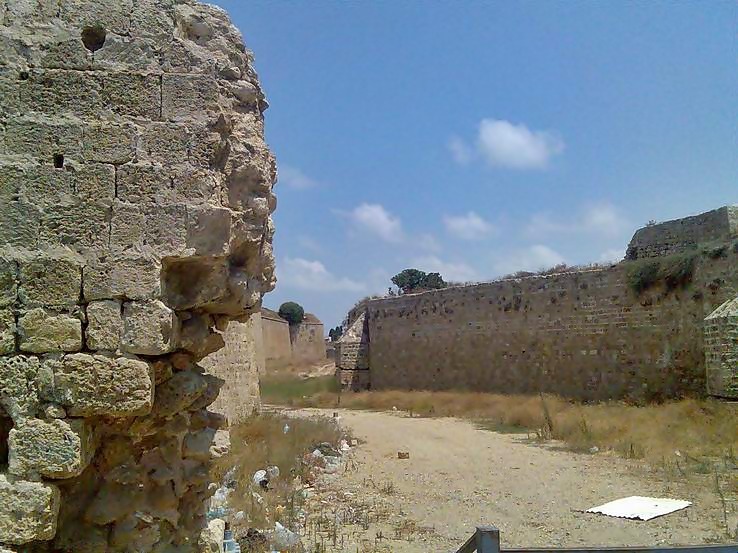 On the Northern and eastern side, which is connected to the land, the Crusaders, and later the Mamlukes and Turks, fortified the city with a dry moat, thick walls and three outpost towers. These massive fortifications (near the eastern gate) were so strong that Napoleon failed to conquer the city after a 2 months siege (1799 AD). A view from the east gate into the old city and towards the market. 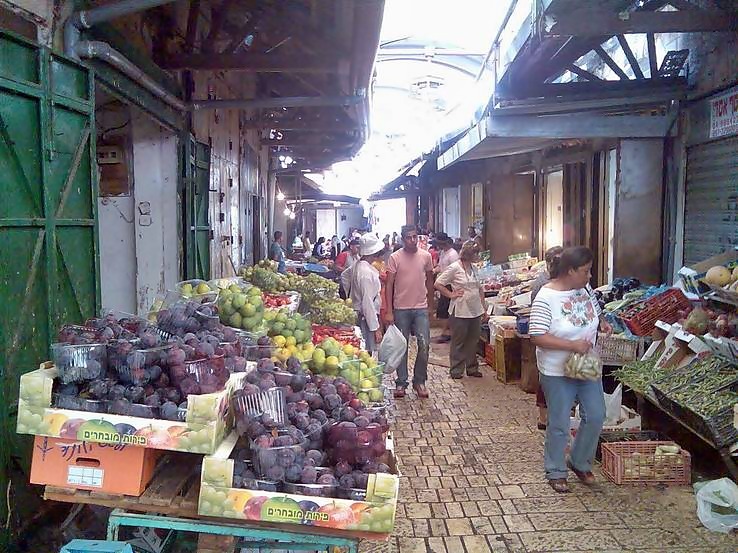 In the old city - a colorful and busy fruit, fish and meat market. You can stroll along these narrow alleys and head towards the marina. The large El-Jazar Mosque in the center of the old city, adjacent to the market, dominates the skyline. 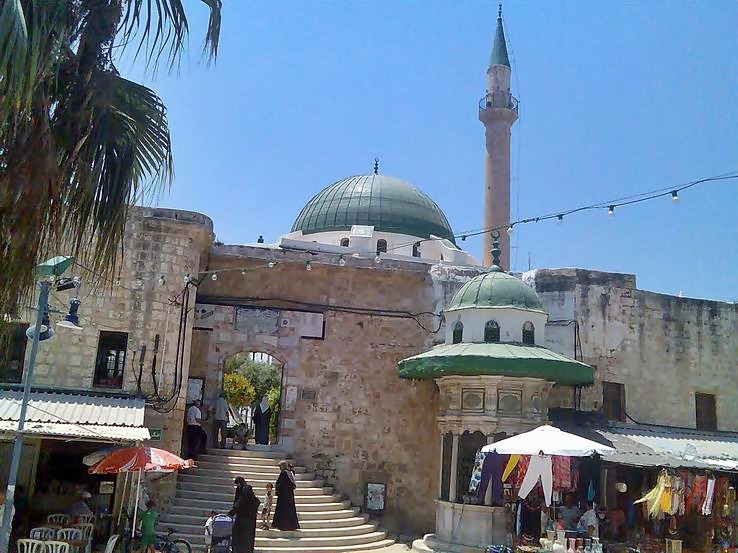 The mosque was completed in 1781, and is the largest mosque in Israel after Jerusalem. In its grounds, the graves of its builder, Jezzer Pasha. Under the yard there are large cisterns that contained the water that flowed from the Aqueduct of Acre. In the old city are 4 Churches and 2 Monasteries, which serve the different Christian sects. Most of them are built over Crusaders time churches, such as St. John on the south side which was built over 12thC St. Andrews. It is best to park the car near the eastern gate (free parking). Then, walk thru the gate along the main road to the El-Jazar mosque. You can stop and have a delicious Arabic meal - one of the best Hummus in Israel is served at the tiny shops. Across the entrance to the Mosque, take a one hour tour under the city through the Crusaders' quarters that were unearthed in recent years. The tour passes thru the complex of the Hospitaller Knights' Halls which were part of the northern walls that protected the city. The tour will take you out to the Turkish Hamam (hot bath). From there, go to the market towards the Marina. After a visit there you can return back to the car. Additional place to visit is in the western side, near the lighthouse. You can also walk along the walls that connect the lighthouse to the Marina. See the review of Tel of Akko, the biblical site of acre. "And when we had finished our course from Tyre, we came to Ptolemais, and saluted the brethren, and abode with them one day. 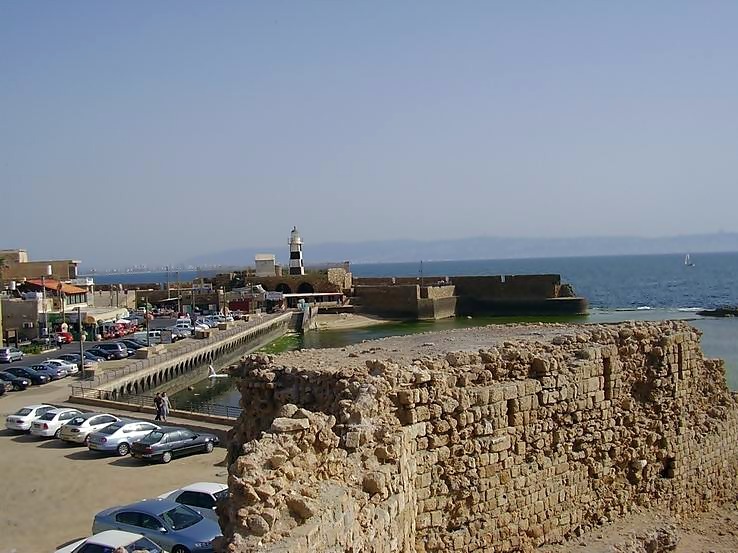 And the next day we that were of Paul's company departed, and came unto Caesarea:..."
The historian Josephus Flavius (1st C AD) has numerous references on Ptolemais (Akko), a major city at that time (and throughout history). A few examples are detailed below. "After this Caesar went for Egypt through Syria, when Herod received him with royal and rich entertainments; and then did he first of all ride along with Caesar, as he was reviewing his army about Ptolemais, and feasted him with all his friends, and then distributed among the rest of the army what was necessary to feast them withal." "And now Vespasian took along with him his army from Antioch ... where he found king Agrippa, with all his forces, waiting for his coming, and marched to Ptolemais. At this city also the inhabitants of Sepphoris of Galilee met him, who were for peace with the Romans.". Ptolemais - Greek name, meaning "warlike". Based on the name of Alexander's general who ruled Egypt after his death. The city was first renamed to "Antiochia Ptolemais" and then by Ptolemy II Philadelphus (238-246 BC) to "Ptolemais" . Check also our Acre sites Gallery.